Even though it’s still more than a week away, I thought I’d get a head-start on St. Patty’s Day. Not that there’s much prep to do. St. Patty’s is one of those glorious holidays that really doesn’t require much effort. Unlike Christmas, which has us cooking and wrapping all month long while simultaneously putting us into debt clear through February, St. Patrick’s Day is kind of a non-event. Sure, there are parades and rivers that run green with Irish pride. And yes, everyone is Irish on St. Patty’s Day. But the only “musts” are wearing shamrock green and watching or participating in a parade. No presents to buy, no special events to plan. My kind of holiday. Anyway, I thought instead of our traditional corned beef and cabbage, I would make a stout-centric menu. Now personally, I don’t drink a lot of stout — that is to say — any. Ever. Something about the foam and the mouth feel, but I can appreciate its place as an ingredient in a bigger dish. And it just makes sense with lamb. Much like that entire bottle of red wine made sense to that chicken a few weeks ago. Here, the savory broth is a mixture of beef broth and stout. Parsnips, carrots and leeks stand in for a standard mire poix. And because it’s an ode to everything Irish, of course there’s potatoes. It’s braised for 2 hours, and thickened with a little cornstarch and water. Toss in some sweet peas and pearl onions at the last minute and Irish eyes will be smiling! Of course, Irish soda bread is a must with this meal. 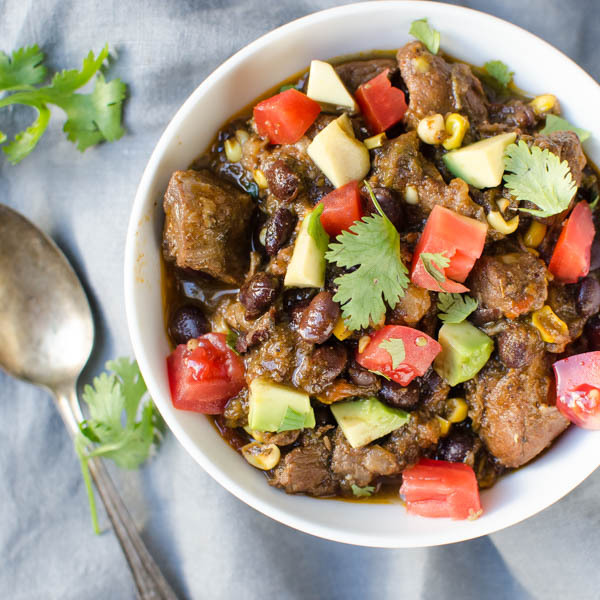 Meaty, savory and loaded with vegetables, this hearty stew is delicious comfort food. In a large dutch oven, brown the chopped bacon over medium high heat. Transfer crisped bacon to a paper towel lined dish. Set aside. In two or three batches, brown lamb in dutch oven, using bacon fat to sear the meat. Use tongs to turn the chunks of lamb over and brown all sides. Add all the lamb back to the pot and stir in the leeks, celery and onion. Cook over medium heat for 3-4 minutes until vegetables begin to soften. Add the chunks of parsnips, carrots and potatoes. Knot a piece of string around the thyme and rosemary and add to the pot. Add bay leaves, broth and stout. Heat just to boiling, place the lid tightly on the pot and transfer to the oven. Braise for 2 1/2 hours. Remove pot from the oven and stir in the cornstarch and water mixture to thicken sauce slightly. Add the peas and pearl onions, stir to combine and place the lid back on the pot to warm them through. Sprinkle with chopped parsley and reserved bacon. I am in love with hearty stews during the winter. Pinning for later. I can just imagine the flavor that Irish stout would add to a stew. Thanks for the recipe! I’ve pinned this for later. Looks and sounds delicious! This looks so hearty! Love it! Absolutely perfect for the COLD weather that has been visiting us in NH a bit too long now! We had a cold blast last week – but back to 80° today!